Take the water where you want it with the AQUA JOE heavy-duty garden hose. The 1/2-inch flow, kink-resistant 75' hose features durable zinc fittings for secure, leak-proof connections plus a protective bend-restriction sleeve for uninterrupted flow. Constructed of rugged, kink- resistant high-grade PVC for maximum durability and performance. Lead-free, phthalate-free and BPA-free. Perfect for watering the flowers, washing the car, rinsing patio furniture or connecting to a lawn sprinkler. 1/2-inch 75 ft. Heavy-Duty Garden Hose Take the water where you want it with the AQUA JOE heavy-duty garden hose. 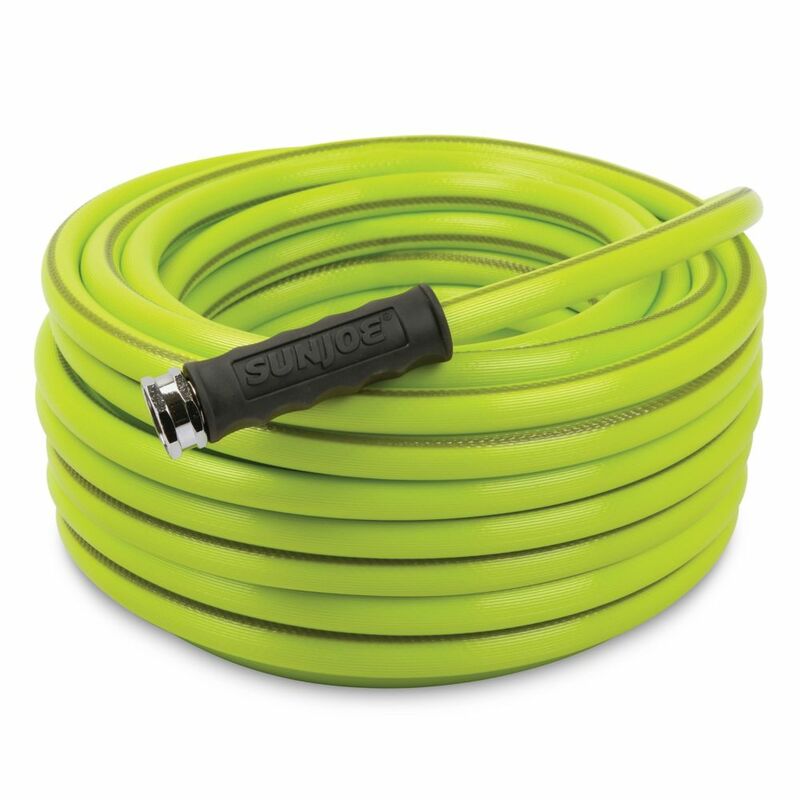 The 1/2-inch flow, kink-resistant 75' hose features durable zinc fittings for secure, leak-proof connections plus a protective bend-restriction sleeve for uninterrupted flow. Constructed of rugged, kink- resistant high-grade PVC for maximum durability and performance. Lead-free, phthalate-free and BPA-free. Perfect for watering the flowers, washing the car, rinsing patio furniture or connecting to a lawn sprinkler. 1/2-inch 75 ft. Heavy-Duty Garden Hose is rated 3.9 out of 5 by 28. Rated 1 out of 5 by Karl from It leaked where it connected to the spigot. I bought... It leaked where it connected to the spigot. I bought a different hose that doesn’t leak, so I know it wasn’t a problem with the spigot. It could also have just been my particular hose, but still. No good things to say about a leaky hose! Rated 5 out of 5 by Sixs from Awesome garden hose The hose works just as they claim. No kinks, wraps up well on the hose hanger and light weight. Rated 5 out of 5 by JT from Picked up at Home Depot locker . Light weight,... Picked up at Home Depot locker . Light weight, and has not kinked. So far I am happy with purchase . Rated 1 out of 5 by Carol from gets kinks in it way too easily. I returned it.... gets kinks in it way too easily. I returned it. Rated 4 out of 5 by Jean from Very light in weight Although it does Kink occasionally, I am very happy with this purchase. I can easily maneuver it throughout the yard and rewind to store very quickly. The first time I had some difficulty rewinding it simply because it was new.... but after using it a few times it was no longer a problem. If something happened to this hose I would buy the same one again. Rated 1 out of 5 by Gardener from Seam split after only 10 uses. Water pressure at home low. Not sure how this hose got a 4 star r... Seam split after only 10 uses. Water pressure at home low. Not sure how this hose got a 4 star rating.